It's been a while since I posted a smoothie recipe on my blog. I love smoothies, as they are so easy and quick to put together and a healthy way to kick start the day. You don't really need to measure out the ingredients, just add fruits or vegetables you like with milk or yogurt. Pair with a toast or sandwich to make a filling breakfast. I had a pack of blueberries and orange lying, so thought to give this combination a try. The smoothie turned out really good with a refreshing flavor. 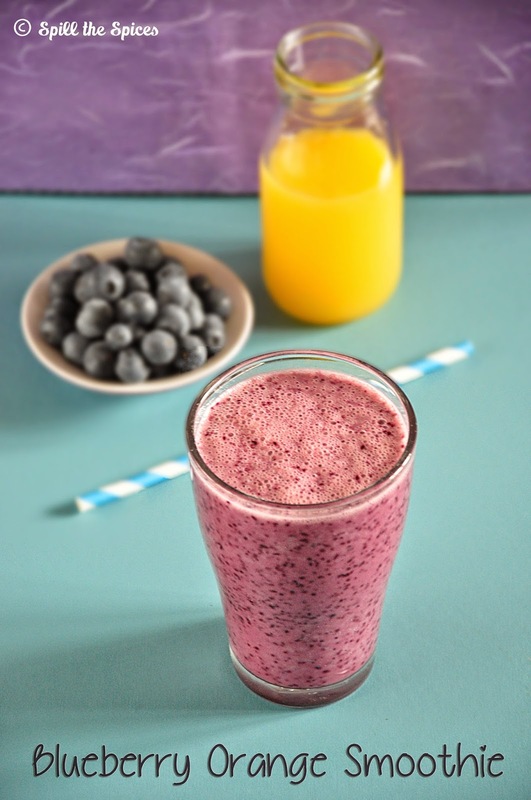 This naturally sweet blueberry orange smoothie is high in antioxidants and vitamin C. One glass of this high fiber smoothie gets you off to a good start in the morning and also meets your daily fruit quota. 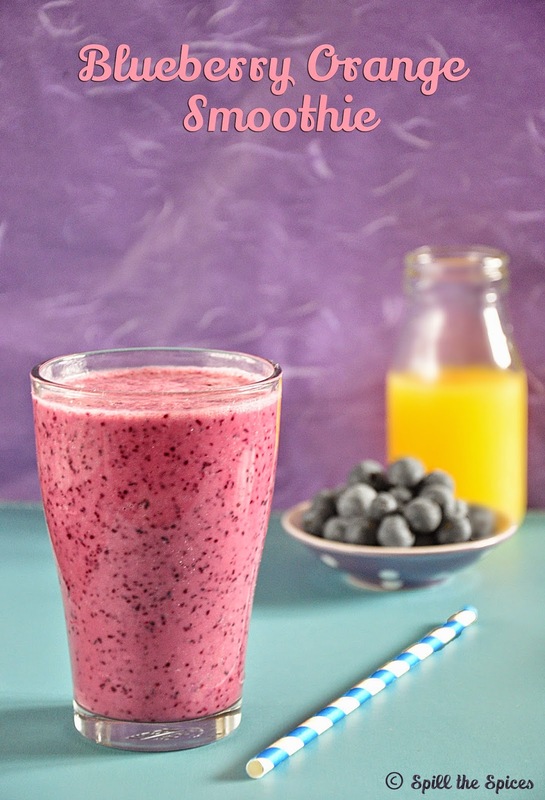 Also check out this blueberry banana smoothie, another simple and nutritious smoothie. Add all ingredients in a blender and blend until smooth. If the smoothie is too thick, thin it out adding little more orange juice or low-fat milk. You can also use plain greek yogurt and add 2-3 banana slices to get a light banana flavor. Instead of yogurt, you can add ½ cup milk. In this case, add a small banana for thickening the smoothie. Healthy colourful smoothie. Love to taste it right now. Blueberry orange smoothie looks delicious. Beautiful pictures Sona. I can have this smoothie daily, so refreshing and healthy. looks delicious.. I love breakfast smoothies anytime! OMG, that glass looks so tempting, love that color.. Delicious and healthy smoothie. Lovely pics..
Blueberry and orange combo sounds great, will try it. Beautifully pictured!